Baptism is the covenant God is offering. It is a sign of God’s love for every human being and the pledge of his blessing. The person to be baptized becomes part of the community of Christians through his baptism. You can be baptized at any age. Many people are baptized as a child. Parents and godparents accompany the baptized on the path towards the community of believers. They endeavor to tell the children about their Christian faith but also about their doubts. 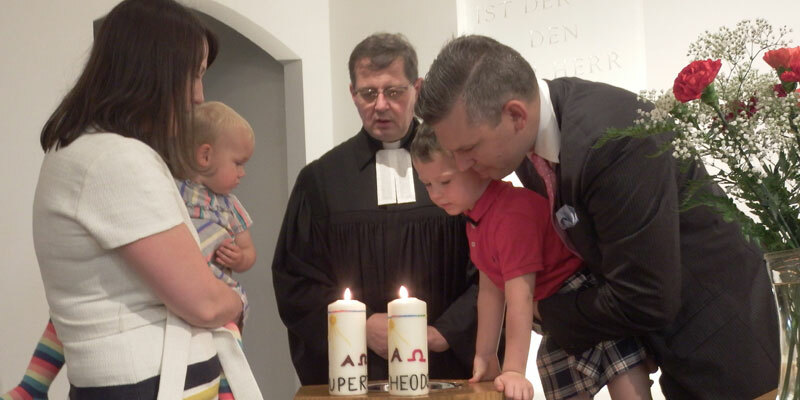 The congregation offers programs for children which will help them grow throughout the years into the faith of Christians. Later, at confirmation, the youth affirm with YES their belief in Jesus Christ. If you were not baptized as a child and wish to join the Christian community, you can be baptized as an adult. Preparation for adult baptism is available; please call the pastor for further information. Please contact the Church office to set up a date for the preliminary talk about baptism, where you receive all necessary information. We baptize in the worship services of our congregation. They take place every Sunday and on church holidays. Godparents who are not part of our church congregation will need a certificate of the parish office of the place where they are living which affirms that they are eligible to become godparents. This will be issued at no charge and can also be requested by phone at their parish office. If you as the parents have a family register please bring it with you to the appointment where we talk about baptism. Part of the baptism is the personal bible verse which will accompany the child throughout his life’s journey. This verse is usually chosen by the parents and expresses what they consider especially important for their child.